Forget the fact that last month marked the beginning of both my thirties and my life as a married woman. I still don't feel quite adult enough to engage in what seems like the very mature act of buying art — real art. Inexpensive prints are one thing, but purchasing an original charcoal or watercolor seems like an awfully big commitment when I've yet to purchase a house. I'm sure a beloved piece of art could find a space in any home, but I'm careful and calculating to a fault. It took nearly half a decade for me to get my bachelorette pad up to my perfectionist standards, and I have no doubt that decorating a family home will take even longer. Simply put, I need to live within walls before I can decide how to adorn them. But none of this stops me from fantasizing about the future, of course, and I have an inexplicable desire for this delightfully titled oil painting by Nicole Newsted. 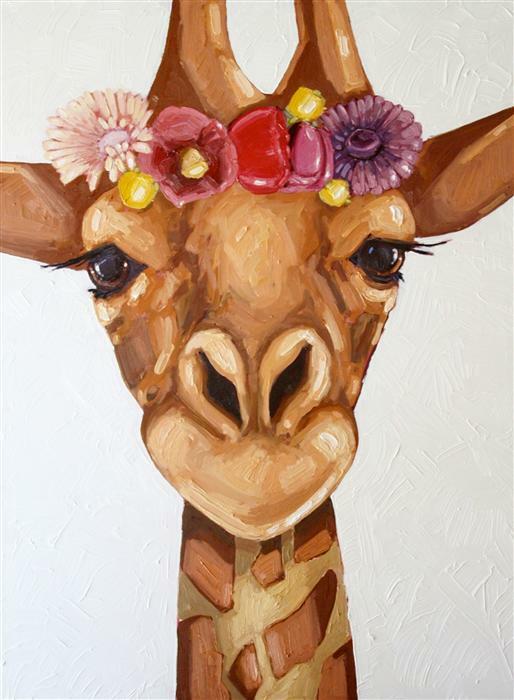 While I'm a big believer in simply buying art you love, perhaps this feeling of not being grown up enough to do so stems from the fact that I can be swayed so easily by a pair of big brown giraffe eyes. Newsted's painting is part of UGallery's holiday sale, which includes over 400 original works of art for up to 60% off. And, for my fellow commitment-phobes, UGallery offers free shipping and a week-long test run, which allows you to try a piece out in your home before making a final decision. Also calling to me (and on sale) is "Rouge" by Elena Zolotnitsky. It plays perfectly to the fashion lover in me while still retaining an air of the classic.